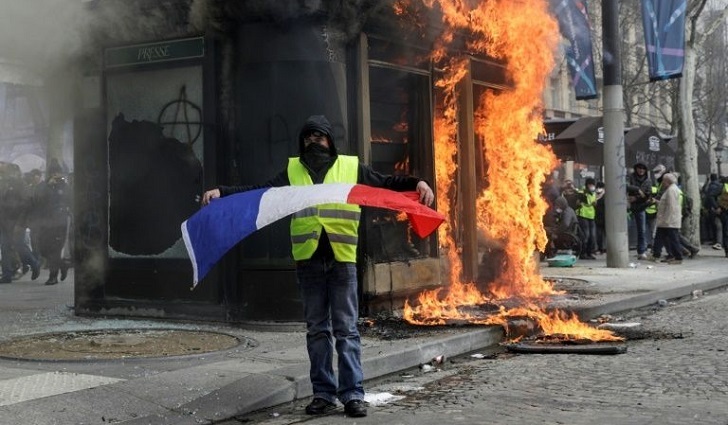 The French government admitted Sunday its security measures had been "insufficient" to stem an arson and looting rampage by black-clad anarchists during a "yellow vest" protest along the famous Champs-Elysees in Paris. Prime minister Edouard Philippe acknowledged Sunday there had been security "flaws" which needed to be rectified. "Analysis of yesterday's events highlights that the measures taken were insufficient to contain the violence and prevent wrongdoing" by the rioters, the premier's office said, adding that Philippe was due to meet President Emmanuel Macron on Monday morning. Already under political pressure, Macron -- who cut short a skiing trip to rush back to the capital for a crisis meeting late Saturday -- has vowed "strong" action. Retailers have expressed dismay over the 18th consecutive weekend of potent anti-government rallies. Saturday's turnout was characterised by a sharp uptick in violence after weeks of dwindling turnout. "It feels like this will never end," said Emir Fatnassi whose shop front on the Champs-Elysees was smashed in by rioters. "You can protest but why destroy everything?... Repairing the windows will cost at least 25,000 euros (£21,000; $28,000), and an important part of merchandise is gone." "There's been a surge of violence," said Jean-Noel Reinhardt, head of the Committee Champs-Elysees, a local association with 180 members. "The authorities must put an end to this situation," he insisted Sunday. Chaos broke out Saturday when groups of so-called "black bloc" protesters swarmed the Champs-Elysees, vandalising and later setting fire to Fouquet's brasserie, a favourite hangout of the rich and famous for the past century -- as well as luxury handbag store Longchamp. Police used tear gas, stun grenades and water cannon to repel protesters who gathered at the foot of the Arc de Triomphe war memorial, which had already been sacked on 1 December. "Yellow vest" representatives on Sunday called on Interior Minister Christophe Castaner to quit over the government's failure to contain the black bloc. "We are neither pariahs nor terrorists," Thierry-Paul Valette, co-founder of the "Yellow Vest Citizens" group, said in a statement. A judicial source said 200 people, including 15 minors, were held in custody after Saturday's events. Socialist mayor of Paris Anne Hidalgo said she was waiting for "an explanation" from the government, declaring herself "really angry" at the "unprecedented violence". "We should be able to master a situation like the one we have just witnessed," she told Le Parisien newspaper. "Enough is enough. And this Saturday went too far!" raged Bernard Stalter, president of CMA France, a national network of chambers of trades and crafts. Last month, Le Maire estimated the economic impact would slice 0.2 per cent points off France's economic growth. On Tuesday, Le Maire and Castaner will face questioning from two French Senate committees over Saturday's events. Questions will focus on "the means put in place to deal with these disorders" and the resulting downgrade in France's trading situation and "economic attractiveness", the Senate said in a statement Sunday. Back in November, Macron was caught off guard when grassroots protesters began occupying traffic roundabouts over fuel taxes. He has loosened the state's purse strings to the tune of 10 billion euros ($11.2 billion) to try to defuse the rallies. Opposition parties on Sunday took aim at the government's failure to deal with the violence on the streets. Meanwhile, Xavier Bertrand, the leader of France's northern region, said the government should not be afraid "to use force and the force of law." European parliamentarian Nadine Morano, of the right-wing Republicans party, got in a stinging blow, tweeting about Macron enjoying himself on the ski slopes while "Paris is on fire".